PLEASE NOTE: THE BLACK HEART is an 18+ venue, nobody under 18 will be permitted entry. MAYHEM, SEPTIC FLESH, SHINING, INCITE, SODOMIZED CADAVER, NECRONAUTICAL, THE BROOD, ATONEMENT, RED METHOD..., CARPATHIAN FOREST, ASPHYX, WINTERFYLLETH, VOICES, ABYSMAL TORMENT, UNHOLY LUST...PLUS MANY MORE! 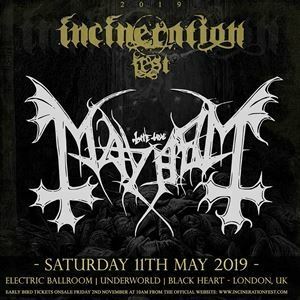 After unleashing the first event in May 2014, Incineration Festival has now seen 5 capacity events hosting numerous worldwide artists including Abbath, Sodom, Dark Funeral, Alcest, God Seed, 1349, Taake, Marduk, Unleashed, Rotting Christ, Master's Hammer, Tsjuder, Anaal Nathrakh, Impaled Nazarene, Melechesh, Immolation and many more. Acting as a mecca for extreme music, Incineration Festival year on year offers a line up consisting of the darkest and heaviest bands.